The Sked-Evac Tripod extends to ten feet high at the three anchors which are equally distant from the center (about 2 3/4 inches). Each of the anchors is anodized red for easy identification, and all are equally well centered to handle a load. The anchors, header, and legs are interconnected with 1/2" stainless steel bolts to provide maximum strength. The header limits the distance the legs can spread. When at full extension, this tripod allows you to bring the patient in a stretcher completely out of the hole. It is rated to handle an NFPA rescue load. Included with the tripod is a chain which passes through the feet to provide greater strength and stability. The chain will not degrade in acids or chemicals like nylon straps or ropes. The legs are adjustable in 5" increments, and Skedco provides safe working load data for each tripod height on each tripod. Brackets are available for mounting most popular winches. The small head and extra-long aluminum legs make this tripod one of the least bulky and most versatile rescue tripods available. Features 3 anchor points which are interconnected with the header and legs for maximum strength. Legs are adjustable in 5" increments to a fully extended height of 10 feet at the anchors. 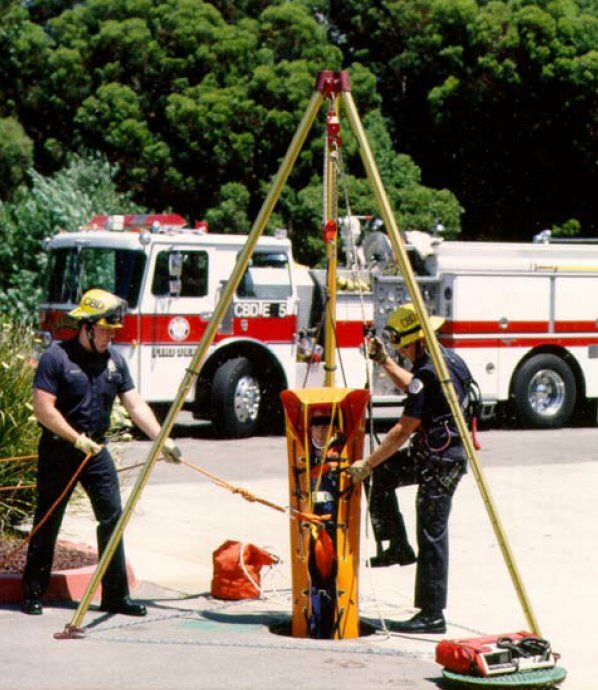 Rated to hold a 600lb 'General Use' rescue load at 102" and 98" extensions; holds 5,280lbs at 119". The optional case features heavy duty vinyl coated nylon material and an extra long zipper along its full length and across its ends to facilitate easy repacking. It has an inside pocket in the center to store the bag of chain which comes with the tripod, preventing the chain from sliding to one end when the tripod is carried. There are handles in the center and on each end of the bag. This bag has a 9" diameter and a 7'1" length, and will make nearly any brand of tripod easier to carry. Tripod only - rope, stretcher, hardware, and fire engine pictured above sold seperately.